This Clean Eating Vegan Pineapple Guacamole is a nice change from traditional guacamole because it has a slightly sweet taste from the pineapple mixed in with a little heat from the jalapeno. But, if you want just a basic guacamole, make sure you try out my Classic Guacamole recipe which is really good too. 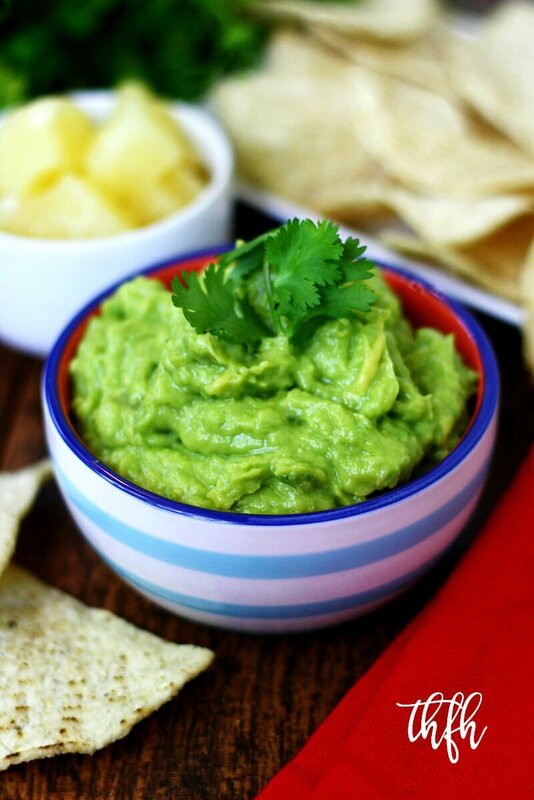 The great thing about homemade guacamole is not only does it cost much less to make at home, but it is super easy to make using just a food processor. Guacamole is very versatile and can be used with chips, crackers, veggies, in wraps, on sandwiches, on nachos and so much more! However you make it, just make sure you make it fresh, with real whole food ingredients. It contains dairy ingredients, GMO’s, refined salt and preservatives. It’s a whole lot easier, and healthier, to just season it with a few simple and fresh ingredients like cilantro, garlic, and onions. Making this recipe takes only minutes and it’s raw, vegan, gluten-free, dairy-free, nut-free and paleo-friendly. Want more healthy dip recipes? Check out Clean Eating Smoky Chipotle Pumpkin Hummus, Field of Greens Zucchini Hummus, Spicy Balsamic Vinegar Salsa or my Clean Eating Cookbook with an entire chapter of 20 healthy, clean eating dip and dressing recipes you will love! Prepare the veggies: remove the seeds from the avocados, dice the pineapple and cut the onion. Add all the ingredients for the guacamole to a food processor and process until it is well combined and to the consistency you prefer (less time for chunky texture, more time for a smooth texture). Transfer the guacamole to a small bowl and gently stir in the 1/2 cup of diced pineapple add-in. The recipe and photographs for "Clean Eating Vegan Pineapple Guacamole" by Karielyn Tillman of The Healthy Family and Home website are licensed under a Creative Commons Attribution Non-Commercial No Derivatives 4.0 International License and cannot be used without my written permission.